Adam Sutherland is director of Grizedale Arts, widely regarded as the UK's premier rural arts organisation. Interview Rupert White. 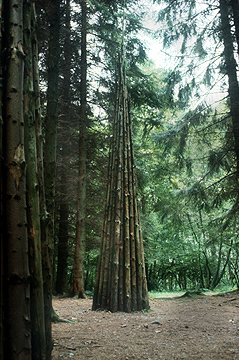 Between 1977 and your arrival in 1999, Grizedale Forest had become known as venue for sculpture in the environment. How did artists come to show in the forest originally and what do you think accounted for the high profile Grizedale managed to achieve? Was this largely due to the international success and popularity of Andy Goldsworthy? The origins of the sculpture in the forest were to do with the Arts Council trying to find ways to support individual practice. The first residencies were David Nash and Richard Harris, between them they set the blueprint for the next 25 years. What they did was directly drawn from US land art - an English version - small scale, thoughtful and polite interventions. Very English really. In terms of art at the time it was a long overdue moment, in fact it was in some ways too late. Thatcher was on the point of becoming prime minister, punk was culturally ushering in a new age and politically, culturally, things were mid-change. The work had the connotations of the early 70s and hippie era, but it was also among the first in a new approach to placing art outside of the gallery context, a forerunner of the public art movement. Grizedale was not able to fully capitalize on the position it achieved so quickly. The first ten years were - if already outmoded - its most creative and successful, culminating or perhaps peaking with Goldsworthy's work in the mid to late 80s. Although his were perhaps the most popular of the works they also embodied a certain lack of meaning or purpose. The gentle intervention, the reflection of natural order, they didn’t really say anything and illustrated just how 'off the beat' the project was. Saying that you do get away with being ten years behind the times in the country, no one expects it to be current. At the same time that Goldsworthy was finishing his work at Grizedale, Damien Hirst was preparing Freeze. In many ways Grizedale marked time from the late 70s up to the late 90s when it had to suddenly and shockingly catch up with the zeitgeist a bit. What were the other problems at that stage? Presumably some of the most well-known works had disintegrated through natural processes, and Grizedale had become much more commercial. Instead of an informal setting for experimental artists, it had become a sculpture trail targeted at families and this was reflected in the quality of the work. Is this how you saw the main issues at the time? Yes, that would be it broadly, but I was looking at it from a national perspective as well, the state of the art world, the somewhat vacuous legacy of YBA and how to make art relevant again. 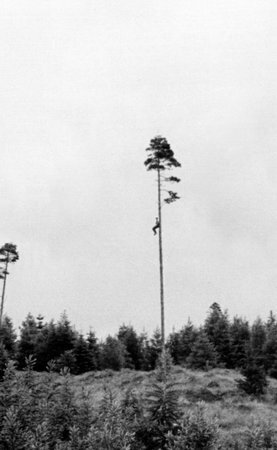 There was an ambition from the Arts Council and the Forestry Commission to move the whole Grizedale thing forward. This provided the opportunity to really develop a whole new approach. I think the Forestry realized pretty soon that I was going too far in terms of what they wanted. Underlying the desire to upgrade the sculpture programme there was a motivation that had to do with making a more successful tourist attraction. The Forestry Commission and for that matter the majority of businesses in the Lakes had moved towards an almost entirely tourism led economy: a service industry model. For example in the forest in the days of Nash (late 70s) there were up to 150 men working in the actual woods. The estate was run extremely efficiently – by 2000 there were a handful and only the bare minimum maintenance being sustained – the recreation side of the FC was hugely developed and the administration became the dominant culture. In many ways the forest and its management is quite a good metaphor to illustrate the degradation caused through tourism the world over. For me alongside (but connected to) the displacement of a 'real' economy, the worst aspect of tourism is the destructive impact it has on the communities that serve it. It's something people in Cornwall are aware of too. There is also the effect on the art and culture of the place which becomes dominated by a need - conscious or unconscious - to keep visiting holiday-makers happy and to get them to part with their money. It can be difficult to step outside this - to make art that is more truthful and noble in its aims - even when it seems necessary and important to do so. Rather pricelessly, the Cumbria Tourist board has taken to commissioning art: to creating culture that is appropriate for visitors. 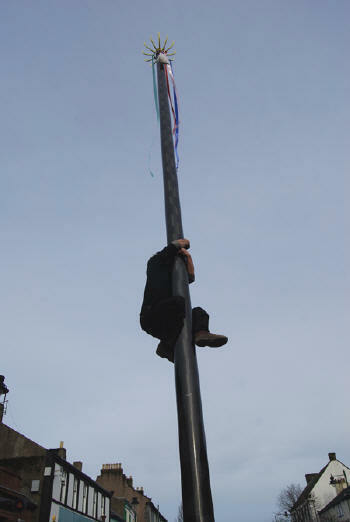 A kind of publicity-stunt art and - what is intended to be - destination art. They and the funders of this scheme found that local culture did not really hit the right buttons. Country shows did not have the facility to draw the A&B consumers, the Conde Naste world-travelers, so they decided to create some very bad art works. The whole thing is hopelessly naïve. I would say dishonest, but I don't think they realize what they are doing. Conceptual art has been embraced as a visitor attraction. Of course this is conceptual art without content or intent – it generally seems to have no motivation other than career development. 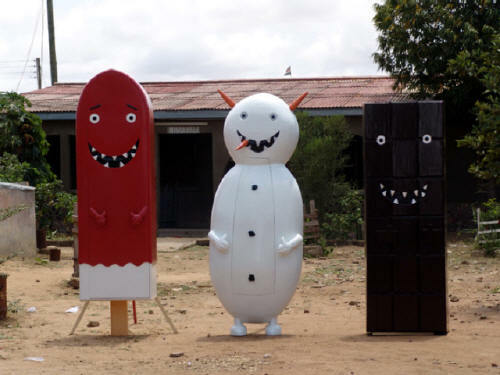 The concern for local culture and the desire to preserve it remains strong but it is a particular type of local culture, toothless, usually craft based. This is not a new thing, the valuing of folk art and of craft activity have been with us from the Victorian era, with a particular flowering eg in the 30s with Cardew and Leach in St Ives. All this type of activity can be interesting and I think when it is connected to political and cultural ideas it is an important force in terms of how culture evolves. Grizedale has tried to connect with many craft/naïve art makers, and celebrated their work, integrating it into the contemporary programme, using it to explain an idea of an approach to creativity and culture that takes as its basis the notion of a flat world, an internet model. Rural culture needs to validate itself, make these craft re-enactments political, express some ideas, some values through creative activity, demonstrate ways of living creatively, consciously. This kind of activity is vital to rural communities and in many ways could and should be just as vital to urban communities as well. Regarding the rural/urban split, it's interesting that you referred earlier to the hippie/punk dichotomy. Much is made of the influence of punk on the keyplayers in the yBa movement - and like punk, yBa was very urban in its sensibility. By the late eighties it was clear that thinking about landscape or rurality, for example, was not of much interest to this influential generation of London-based artists. Amongst other things, Grizedale has been a reminder that there is an alternative. 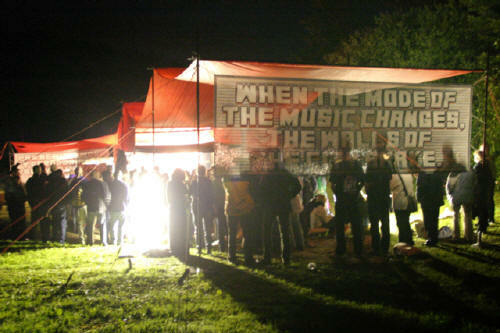 After Grizedale, the Garden festivals and art in industry programmes of the late 70s public art became very urban. In fact there was a version of the early Grizedale works re-done in Gateshead, where all the same works were made but in steel and stone. I was conscious when I came to Grizedale that the urban public art and the warehouse shows had become repetitive and that the rural was ripe for re invention. There is an inevitable cycle in the search for the new and the creation of the original that determines a constantly changing area of interest for artists. You can see these waves of interest come and go. The association of the Lake District with Wordsworth is important to mention. In 'Adding Complexity to Confusion' you describe Romantic poets and artists going into rural exile in places like Cumbria in the 19th century. In what ways have you approached this theme? The idea of addressing the romantic artist was really about looking at the trajectory of romanticism. I think that all artists have been working in the romantic tradition: the sole practitioner, at odds with society expounding their individual vision and expressing their ideas of freedom. To me that is an idea that has really run its course and overstayed its welcome: 'individual freedom' in particular being a terrible and destructive burden for society to bear. Inevitably, yes, a lot of the subject matter of the programme has been centred round romanticism and in particular the project 'Romantic Detachment' which used a wide range of artist-practice to ponder the way we romanticize other cultures and the impact that has on our own. It was in many ways a project that aimed to debunk the notion of the romantic artist – I suspect that like many of our projects it did the opposite. True, but it is interesting that the artists you mention all made art works that drew from the context but did not really become part of it. In a way, although many of these works can be seen as the most formally successful, it is the work that integrated that I feel to be the most useful and successful. A lot of this latter type of work had no art world output, being largely process with outputs illustrated by the legacy: what people involved took from the experience and how that was then used. 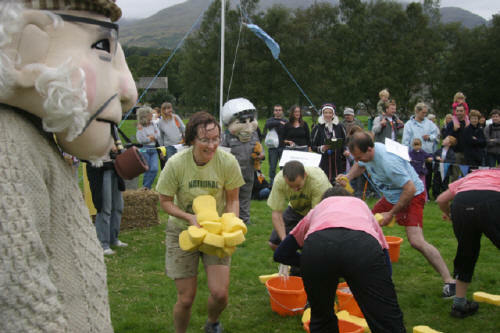 For example projects like the Coniston Water Festival which continues, but without Grizedale leading it. We, and the artists are then able to take a role as a participant. My own work and ideas were then, and remain, that art has to have a real use, be valuable to society, that it needs a useful role, it should make sense. A lot of what I was reacting against had nothing to do with Grizedale but when I took the job I saw the potential to start again, reinvent what it was and to some extent how art could work. 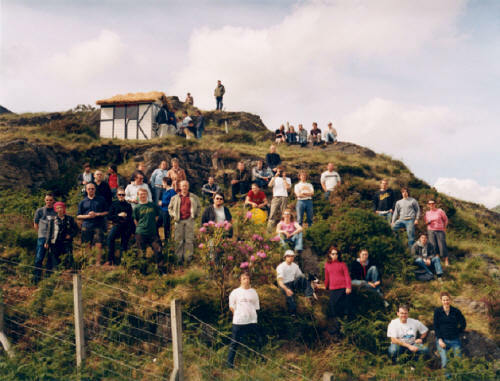 Certainly in the first year I was at Grizedale the idea was to shock a bit, get some attention and the artists that I brought in, Marcus Coates, Calum Stirling, Karen Guthrie and Nina Pope (picture below right) etc were keen to define a different approach to what had been there before. It was a difficult transition is perhaps only now - 10 years later being accepted (an adopted albeit in a different form) by the local population both arts and non-arts. I am very interested in a new model for artists/creative people, where there is a connection to a place and a taking part in community, being part of a local community. This doesn't mean you have to be on good terms but it does mean you have the same rights as everyone else and that you 'belong'. For artists being part of a local community means serving a useful purpose, probably more of a part time role, but seeing yourself as one of the community resources akin to other local trades. Yet much of what you did, particularly in the early days, was met with hostility by local people and tourists alike. You received threats and abuse from many. Do you want to describe this response in more detail? What were they objecting to? Cumbria, like anywhere doesn't like change, the culture of the Lake district is complex in that the majority of the population have elected to be there (not born to it). And over the past 50 years the economic conditions have conspired to move locals out and for lake district enthusiasts to move in: increasingly people who have moved for purely lifestyle reasons. People who have moved to a place because they love it are consequently very protective of it, but also unconfident about the place they live in, unable to play with the context, the constraints, in case they break it. It's a very unnatural situation. I was brought up in the country and inherited from my parents a life- long loathing for it, albeit tempered by an understanding and connection to it, possibly best described as a love/ hate relationship. There is much that I believe is valuable about the rural context, much that society can benefit from, a richness and complexity, but none of this is in a way 'allowed'. There is an interpretation of the countryside as a one dimensional place, the Lake District particularly, a beautiful landscape - nothing else. That just isn't true. It's a fought over, troubled, twisted place in which the usual human condition is explored and expressed. But it also is - like any area of land - a fundamental place, a place that illustrates how we survive, feed ourselves, grow food, operate as social and interdependent animals. A lot of my dissatisfaction with the rural is the fact that it does not sustain an intellectual life, that it is so simplistic in its conception of itself. That it isn't stylish, cool, clever. But there is no reason why it shouldn't be, and on occasion - and important occasions it has been. Coniston at one time supported Ruskin and his followers: the lake was surrounded by intellectuals, radical thinkers, people that had impact on the world. Alongside Ruskin there was Collingwood – Ruskin's secretary and a painter who instituted various guilds of crafts and art including establishing the Lakeland Painters annual exhibition in the village hall. Sounds pretty normal now but would have been revolutionary at the time. Canon Rawnsley and Octavia Hill founders of the National Trust, radical again at the time, and Rawnsley developed a multitude of innovative projects locally. Ruskin gave an annual lecture in the village hall, he gave talks at the school, he sited educational art works and undertook experimental installations and performances. This is just by way of an illustration, but the rural context has across the country contributed and often driven many of the principle cultural movements affecting the development of the UK. Obvious ones being St Ives, Cotswold's arts and crafts, Lake District Romanticism and Ruskin, Eric Gill and so on. So why do we associate it with such basic properties, why can we not see it as cultural in a broad sense? There is a sense of retreat in many of these movements, getting away from it all, and maybe that is the principle idea we take from these movements in the same way that we take the rural idyll from romanticism or Thomas Hardy, a part of the picture, omitting the difficult and meaningful moments, actually the substance. This one dimensional vision is really endemic throughout contemporary society, artist and arts organizations are only too keen to simplify their role, specialise in being, or rather marketing themselves, as a single strand, like digital or artist-led or environmental. Despite the initial hostility you did succeed in bringing some important artists to Grizedale during the noughties - including two Turner Prize winners - and in this sense you have managed to keep its profile high in the art world, but how successful have you been in engaging or relating to the general public? What strategies have you used and how important has this been to you? Bringing high profile artists to Grizedale was in part aimed at raising profile and status, in effect to make it a more desirable place to be associated with. I feel much more excited and proud of all the younger artists that have come through Grizedale, absorbed much of what we are trying to do, and translated that back into their careers. The artists that have worked here have brought the rural context forward, made it much more vital and complex within how we understand ourselves, that's the real value. It's not what comes in that matters it is what goes out. Just as an illustration of the shift of interest towards less centralized activity, the British Art Show had historically has shown little work from outside of London and Glasow, in BAS6 there were over 25% non London based artists of which the majority had been involved with Grizedale. The relationship with the 'general public' has been complex, firstly I would say that we don't do a great deal with the visitors, the public we principally aim at are a local and participatory audience, and in many ways I see all the local work we do as the resources of the organization and area, this is the interesting stuff. 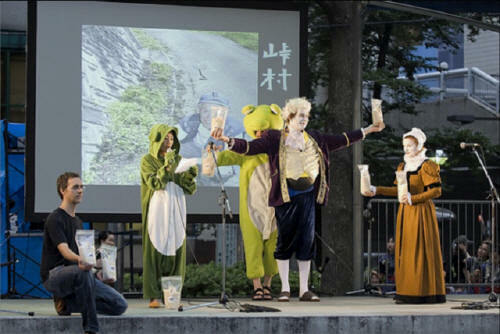 I do think that we need to address the visiting population, find ways to make the tourist experience more engaging for all parties and the project in Japan attempted to do this, acknowledging the value of the visitor and trying to find ways that the impetus to visit a place can be converted into a contribution to that place. You've recently opened Lawson Park. What plans do you have for it? Does the fact that it will be a functioning farm mean your organisation will be taking more interest in environmental issues in future? This seems to be something largely absent thus far from the Grizedale aesthetic, but, ironically, it would represent something of a return to the land. Lawson Park was envisaged first in 2000, it just took 10 years to get there, the site itself has been in development for 7 years with the gardens and farm being claimed from rough fell. Funding the land development has been and remains extremely difficult, so the majority of the land related work was done by partner Karen Guthrie and myself. The ambitions around the farm are to do with making an inspiring place to work, involving people in that work and creating an arts space that operates in a different way, being wholly participatory. The ideas about how it works are to do with the relationship between work and leisure, ideas about how communities are dependant on the communal food production for their cohesion. How the organization and its aims can be represented through the way the farm is managed and run - and in some ways the whole site, farm and buildings are conceived of as an art work. Something ever changing and flexible - able to integrate multiple points of view and projects. People often refer to it as an attempt to create a utopia, or a commune but that is not really the ambition, there is an idea of a new kind of community that is drawn together for different projects and in different configurations but that is fairly loose and probably an idea best not laboured. I do also see it as a comment on contemporary society, a working, livable satire, particularly In terms of the Lake District and the local economy and way of doing things. I hope it works as a rebuke, projects like the honesty stall and even design details like the small number of bedrooms, the fact that we don’t rent it out, the no car access policy all are the opposites of local expectation and development agency’s ambitions. So although there is a consciousness of environmental issues that is not the principle idea. I am rather cynical of the environmental concerns finding - maybe particularly here - that they are just another marketing device. 'Sustainable tourism', 'green destination', 'low carbon town': all well adopted language but entirely meaningless - or rather actually what I like to call lies. It’s easy enough to be green. Just grow your own food, stop spending money, don’t have kids, don’t keep pets – no hardship, either a pleasure or a relief. We did a while ago offer carbon offset to arts organizations wanting to attend international biennales. Satirical huh? More seriously the role and behaviour of arts organizations needs to change, we should be offering solutions/alternatives, not pointless questions we all know the answers to presented in underused and overheated buildings. Lawson Park does offer an alternative way of living and many of the very basic things are – it seems - quite challenging, like eating from the garden, it can be quite boring: people need avocados! We had a bit of an argument the other day about not providing orange juice, it being considered a basic and not an exotic as we determined it to be. Saying that we are not really so principled and accept that much of this is lipstick on the gorilla. 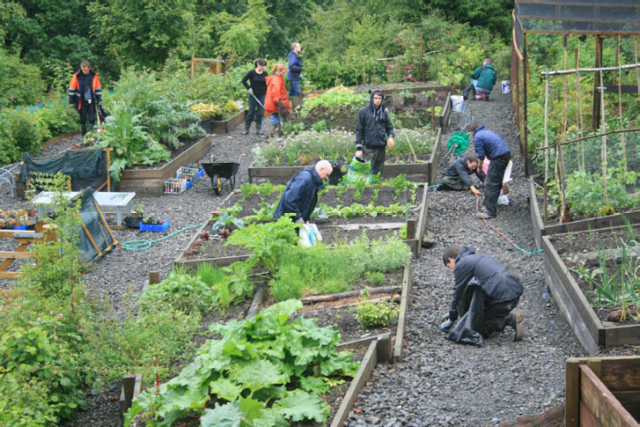 The projects we do with the village are largely about growing your own food, being conscious of the control you have of your and your communities future. We consider ourselves as part of the community, so taking part and able to make enemies, complain and push ideas. At the last Village Horticultural show - where we always show vegetables - we ran a kitchen demonstrating multiple ways of using cabbage from kimchee and saukraut to pakora and Japanese soup, normal stuff integrated into normal life.